Located a 5-minute walk from Calangute Beach, Jewel Inn features a traditional Indian spa offering a variety of therapies. An outdoor swimming pool and fitness centre also await guests. 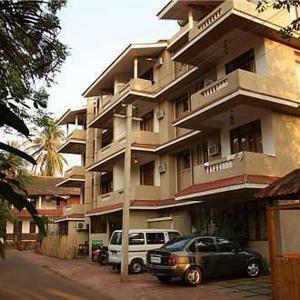 Jewel Inn and Spa is a 1-hour drive from Dabolim Domestic Airport. Thivim Railway Station is half an hour’s ride away. Rooms feature classic wooden furnishings and come equipped with air conditioning and a minibar. A work desk and seating area are provided. Guests can approach the tour desk for travel and sightseeing arrangements. Laundry and dry cleaning services are available in this hotel. Room service round-the-clock is also offered for guests’ convenience. A spread of Indian, Chinese and European cuisines can be enjoyed at Pearl restaurant. Sapphire, The Bar, specialises in a variety of drinks and cocktails. Free! All children under 5 years stay free of charge when using existing beds. One child from 5 to 12 years is charged INR 400 per night and person in an extra bed. One older child or adult is charged INR 600 per night and person in an extra bed. There is no capacity for cots in the room. Supplements will not be calculated automatically in the total costs and have to be paid separately in the hotel.